Usually, a text message or voice mail first thing on a Monday morning is something to be wary of…a harbinger of doom, a portent of evil, an ‘ill wind that blows no one good,’ or the foreshadowing of something even more nefarious. Like the principal of your son’s middle school calling at the break of dawn on a Monday to inform you that Junior was in deep *insert noun of your choice here* for something he did late in the day on the previous Friday, to wit: concealing a game camera in the girls’ locker-room before the big co-ed volleyball game. But this was not to be the case on that fateful sunny Monday morn in early May. THIS…was a call I could sink my teeth into. My friend and Firearms News contributing writer Scot Loveland called and told me that editor Vincent DeNiro had a rifle that needed to be put through its paces. He described the weapon and I immediately knew what had to be done. 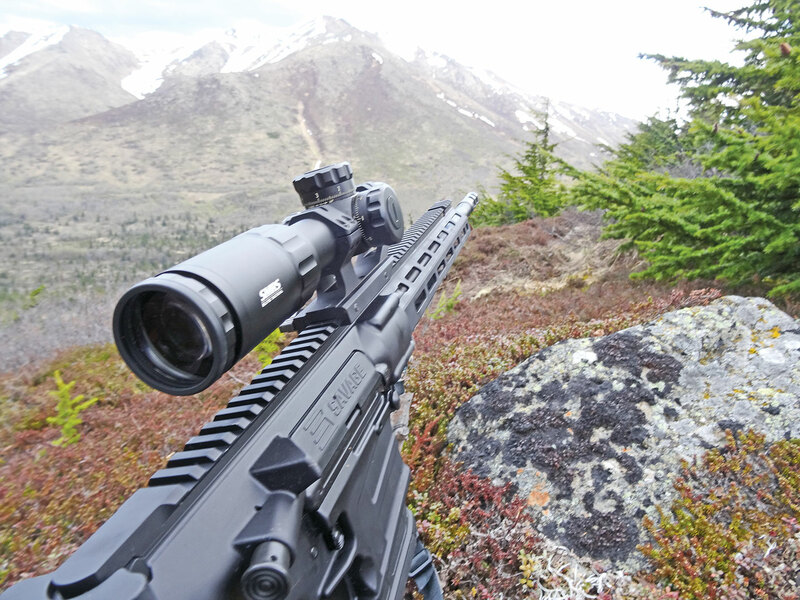 Calls were made, parcel services were mobilized, and a brand-spanking new Savage MSR-10 Hunter in .338 Federal was en route to ‘The Last Frontier’ for testing and evaluation on a brown bear hunt in the wildlands of Alaska’s Kenai Peninsula. When one first moves to the 49th State, new friends and acquaintances spin what seem like fantastic tales of their Alaskan experiences seemingly rife with exaggeration, if not outright fabrication. But, if you remain here for a spell and venture out into the wilds (or sometimes merely your backyard), you quickly learn that these stories are not as farcical as they seem. As with many other pursuits, pastimes, and guilty pleasures that involve an appreciable degree of personal risk, such as cigarettes, alcohol, sky-diving, or a good old-fashioned game of lawn-darts, it is important to know what you are getting in to if you plan to venture into Alaska’s back-country. 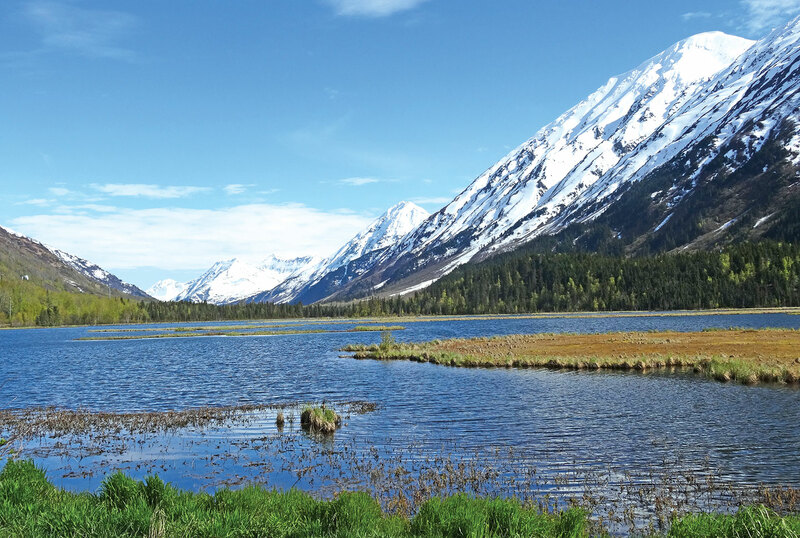 The moment you leave your home, hotel, boat, or other vestige of civilized shelter and venture into the wilds of Alaska, you are entering an entirely different world. You are traveling into a sometimes-ruthless environment that can’t be bested by mere state-of-the-art gear, clothing, or weapons. If you go it alone, you had better be equipped with what corporate America calls KSA: Knowledge, Skills, and Abilities. Or luck. Or a vial of lucky orphan tears, fairy blood, and unicorn dandruff gifted to you by an old gypsy fortune teller at the county fair. Because lacking those elements can only mean one thing: bad times. 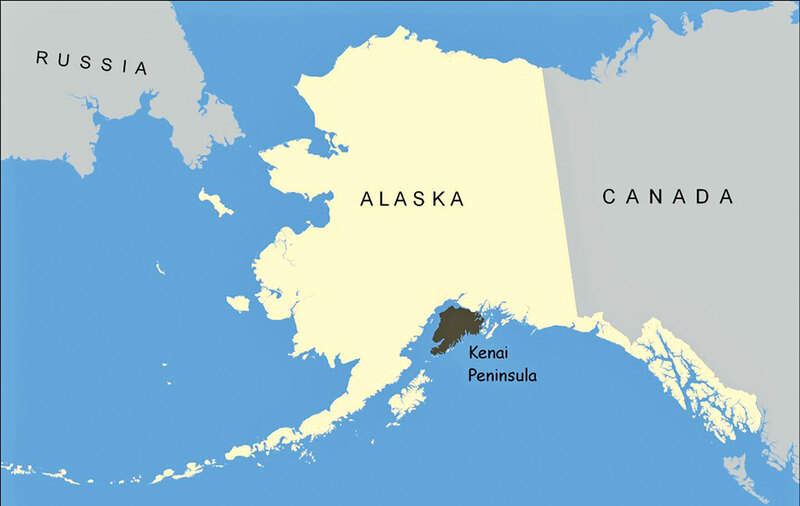 The brutal, unforgiving weather conditions, the massive scale of its terrain and geography, and the Pleistocene/ice age-sized bears and unique game species that roam the 49th state all serve as stark reminders to one who enters Alaska’s intensely beautiful back-country that you are no longer in the minors. You are now, prepared or not, playing in the big leagues. The Savage MSR-10 surveying the Chugach Mountain Range. But enough with the ominous portents and cautionary hokum. It’s time for a true tale of derring-do and backcountry adventure. 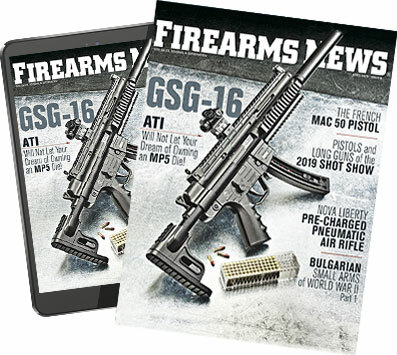 So stoke up the fire in your hearth, grab a tasty, refreshing beverage (or three), and harken as I spin you a brief history of Alaska, the rifles that ruled it, and a more modern tale of…the ‘Trial by Fire’ of the Savage Arms .338 Federal MSR-10 Hunter in the unforgiving wild lands of Alaska’s Kenai Peninsula! In 1867, the Russian government was strapped for cash, and Tsar Alexander II was not about turning any of his stately Crimean Black-Sea bachelor cribs into timeshares to earn some extra scratch. So, in what hip real-estate historians still refer to as “The Best Investment Property Deal EVAAAH!” the Good Ol’ USA purchased the Alaska Territory from those shifty Cossacks for 7.2 million dollars, or roughly two cents per acre. 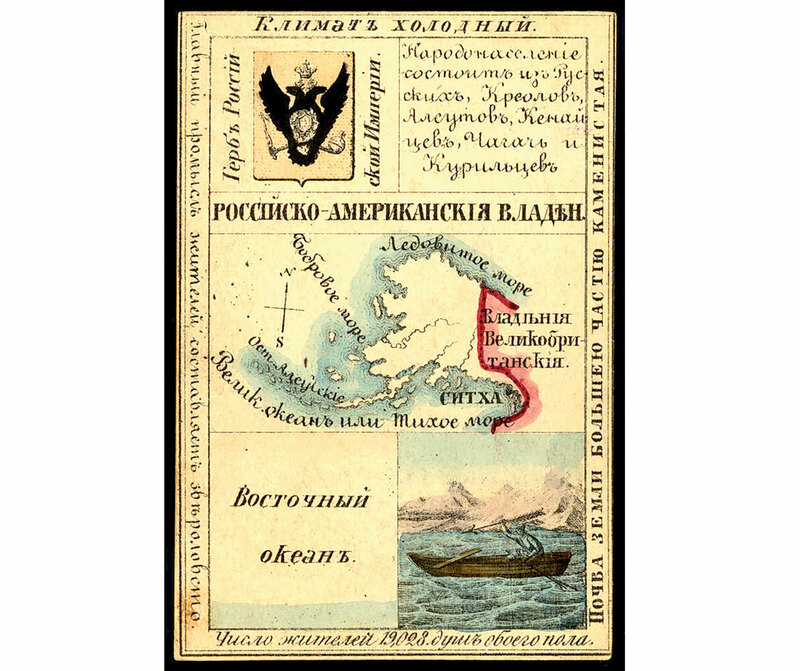 Russian geography card from 1856. During World War II, a Japanese naval and land offensive touched her shores, resulting in air and ground combat in the remote, inhospitable Aleutian Islands during what is now referred to as ‘The Forgotten War.’ In 1959, a new star was added to Old Glory and ‘The Last Frontier’ transitioned from a remote U.S. territory into the 49th state of our grand republic. Alaska became the northern focal point and first defense against the Soviet Union during the Cold War. But nature had something far worse in store for the 49th state than Soviet threats or rhetoric. The 1964 Good Friday’ earthquake, a seismic event of biblical proportions, combined with monstrous tidal surges to wreak massive devastation on her cities and coastline. But better times were in store for the great land. An economic boom and rapid modernization went into full swing when oil was discovered on Alaska’s north slope. Following this discovery, the U.S. oil industry went totally sick-house/gangbusters after construction was completed on the Trans-Alaska pipeline in 1977. Throughout Alaska’s chaotic, rough-and-tumble history, she was first and foremost a WILD PLACE…a remote and unforgiving land where you AND your gear had to be tough to survive. Hunting, trapping, and fishing—to Alaskans, these weren’t pastimes or hobbies, they were a means of subsistence. They were skill-sets that determined if you could survive in America’s furthest northern hinterlands, or be forced into returning to the lower 48 with your tail tucked between your legs, or worse, in a pine box. But through these turbulent years of triumph, tragedy, and transition, one truth remained a constant. The bolt-action rifle ruled over the last frontier with an iron fist. Bolt-actions were practically MADE for the most massive state in the good ol’ U.S.A. They were rugged, reliable, relatively uncomplicated, and capable of firing massive, dangerous game-stopping rounds, such as the venerable .375 Holland and Holland Magnum, .338 Winchester Magnum, and a wide assortment of other life-taking/heartbreaking/shoulder-bruising calibers capable of harvesting moose, brown bears, and Soviet-era BMP armored infantry vehicles. A comparison between a .45-70 and .338 Federal. Let it be known, however, that Alaska and its denizens were not completely prone to rigidity, nor were they adherents to the ‘one-trick-pony’ school of thought when it came to long guns. A slight degree of intransigence was tolerated throughout the rugged northern hinterlands in the form of large-caliber lever-action carbines and rifles such as the venerable .45-70. But in the end, these cheeky interlopers were still bit players in the great Alaskan backcountry melodrama. It was the bolt-action rifle that reigned supreme in Alaska throughout the modern era. But times change, and so has current-day Alaska. With daily commercial flights to the furthest reaches of America’s northland, any need for a heroic dogsled relay to Nome for the delivery of serum to nullify a deadly diphtheria outbreak is depressingly slim. Iconic Alaskan cities and towns like Anchorage, Kenai, and Fairbanks now have modern conveniences such as running water, indoor outhouses, major chain/package stores, I-Max theaters, a nationwide coffee-shop franchise noted for its generous restroom policies, and other instruments of the Devil. In this spirit of change, the 2018 brown bear season was also about to have a spring makeover. A spring makeover aided and abetted by a black rifle in a caliber formidable enough to take any game on the North American continent. 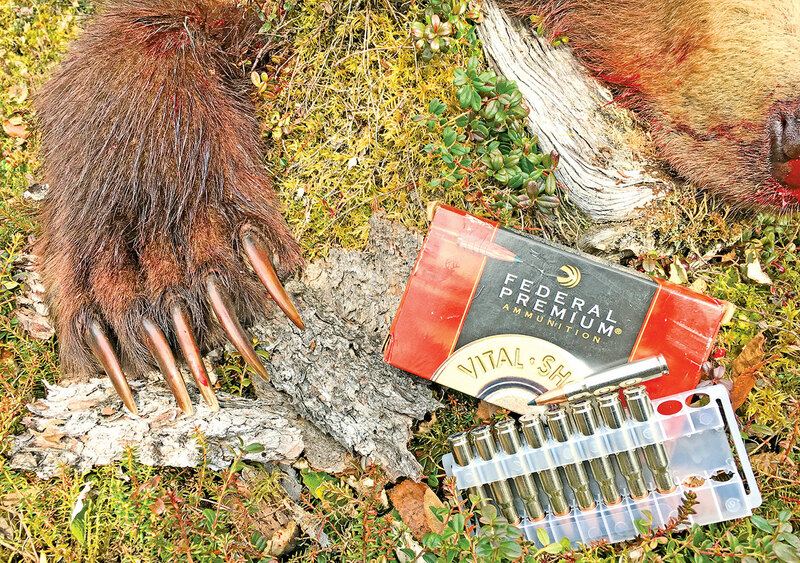 The .338 Federal cartridge is what many Alaskan bear hunters would consider a ‘tween.’ It is stouter than intermediate cartridges like the .308 Winchester, but not quite leviathan enough to cause Liam Neeson to start freaking out and releasing IT instead of a Kraken or something even more menacing, such as a .375 H&H or .458 Winchester Magnum. But notwithstanding its bigger, more brutish bolt-action predecessors, the Savage MSR-10, in .338 Federal, fields a round that is capable of sending a lot of hurt down range, en masse, courtesy of a 10-round or 20-round AR-10-based magazine. As a bonus, it also sports the moniker ‘Caliber-Multi’ on its lower receiver that denotes it has the capacity to be re-barreled in order to fire other AR-10-class rounds like the .308 Winchester and the 6.5 Creedmoor. The Savage MSR-10 Hunter in .338 Federal field strips just like any other AR-15 or AR-10-style rifle. The MSR-10 Hunter sports a Blackhawk! Knoxx AR Pistol Grip complimented with a multi-position Axiom Carbine stock, to which is attached a generous recoil-absorbing buttpad. The trigger is nickel-boron treated, the upper is topped with a Picatinny rail from stem to stern, and the stock is a free-floated proprietary ‘M-Lok’ design. 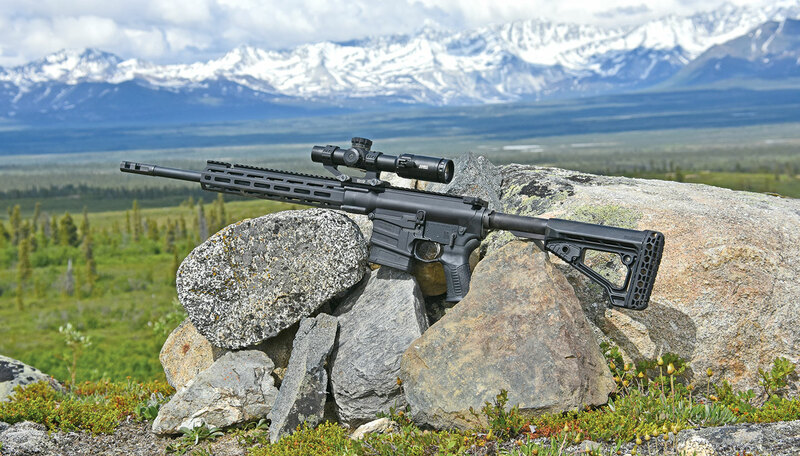 Melonite-treated steel adds to the rifle’s rugged profile and resume. 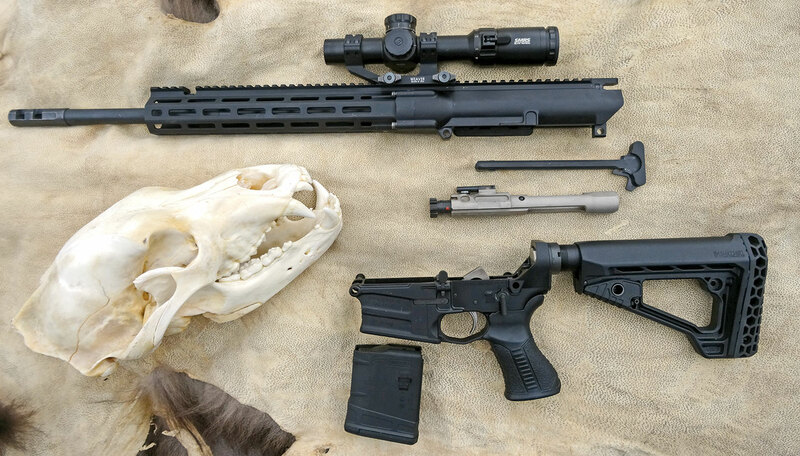 If you like a little peace and quiet (or just the quiet part), the rifle features an adjustable gas block and an 18-inch/5R rifle barrel threaded and ready for a suppressor. Hunting ice-age-sized predators that are capable of taking (and dishing out) massive amounts of damage is serious business, so I chose an optic I’ve used for years in law enforcement and while hunting in Alaska’s lowland/brush country: the Trijicon ACOG (Advanced Combat Optical Gunsight) TA31. The ACOG is always there for you. Its design is rugged (for you Lord of the Rings fans, it may be manufactured from Mithril, it’s that tough), and the reticle is always lit up like the 4th of July (but greener) with the help of radioactive tritium and light-gathering fiber optics. 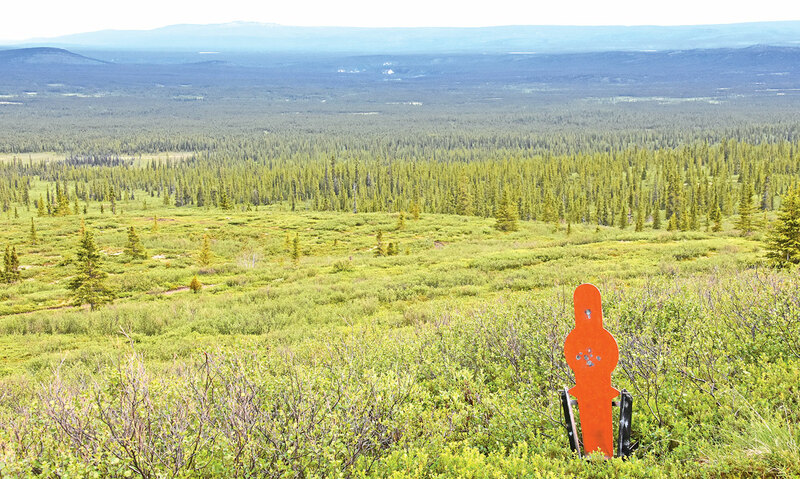 In the event you need to stretch your rifle’s legs, some ACOG models sport a reticle pattern capable of taking the lead you throw all the way across state lines…or at least to the 1,000-yard marker. During its stay in Alaska, the MSR-10 Hunter was destined for two separate trials: ‘Bar-huntin’ (that’s ‘bear hunting’ to all of my friends in the lower 48) followed by a day or two of range testing. 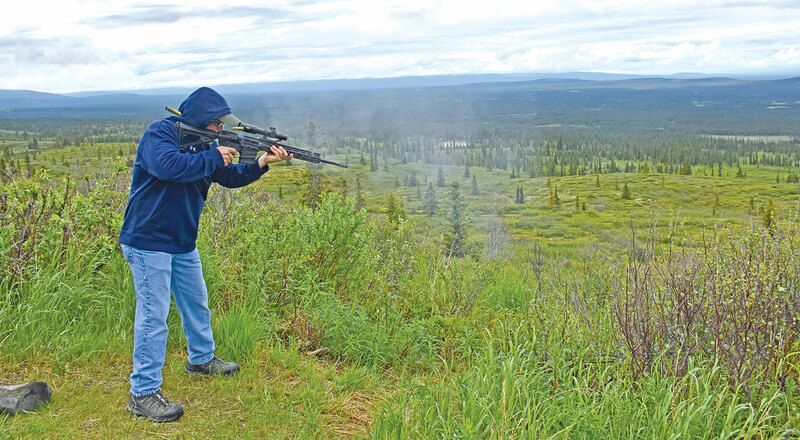 The first evaluation phase would involve putting the rifle through its paces in ‘Bush-Alaska’ on a close-quarter brown bear hunt. 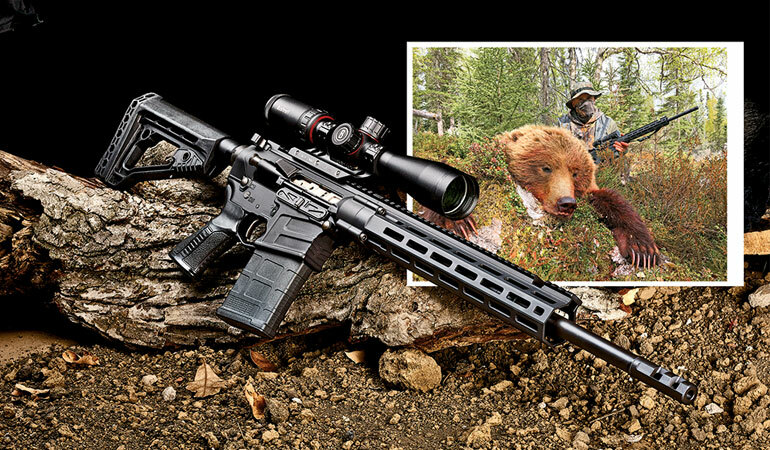 This hunt would test whether or not the .338 Federal Savage rifle could ‘Put its muzzle where its mouth was’ and live up to the ‘Hunter’ portion of its title. Since the rifle would be employed in a danger-close environment, range day one was engineered for one purpose: gearing up for a fight. A fight that would consist of hunting and harvesting an Alaskan brown/grizzly bear at a distance of 25 yards or closer…and not from a tree-stand or hunting-blind. Because that’s what sissies do. And also anyone that orders a coffee that has more than two parts to its name (ie: Coffee-Black vs. Chi-Soy-Latte-Machiatto-Hello Kitty-Pumpkin Spice-Dolce). Blasting away with the Savage MSR-10 was…a blast! Notice two shells in the air with one on the way and the lack of significant muzzle rise. I arrived at the range ready to shoot. Before I could fully assume my ‘steely-eyed, consummate shooting professional’ persona and send the first round down-range, however, I was approached by an on-duty range officer and a shooter from another table with questions about the freshly unboxed MSR-10 Hunter. They noticed it was an AR-10-based rifle, but their curiosity was even more piqued by the .338 Federal boxes accompanying the rifle on the shooting bench. I’m pretty sure if there was an 11th commandment in the bible that read, “Thou shalt not covet and/or greedily eyeball the gun of the guy next to you,” these fellas would be found in gross violation. Aside from the aforementioned rifle-envy, we had a nice talk, and they both agreed the rifle, combined with the .338 Federal cartridge, seemed extremely capable. 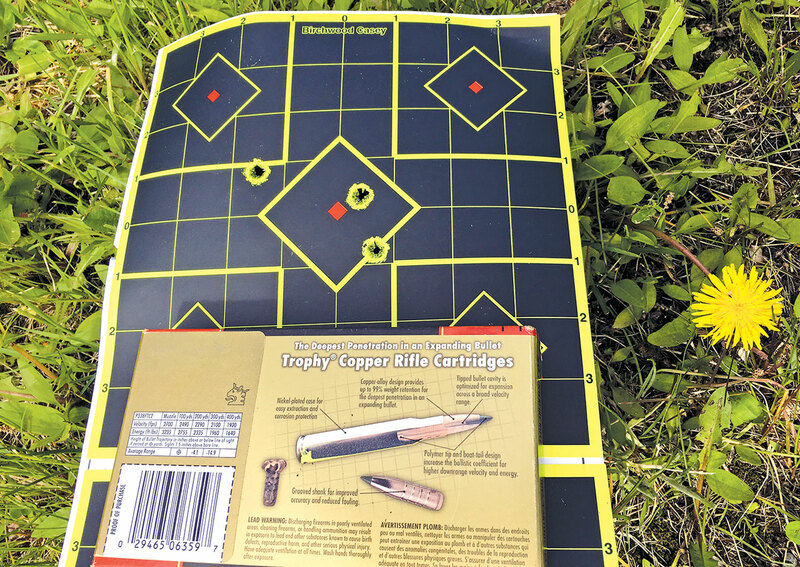 After they departed, I set up my gear and it was time.I sighted the rifle in with the round I planned to use for the brown bear hunt, the 200-grain Federal Premium ‘Trophy Copper’ round. These rounds take to the air from the muzzle at approximately 2,700 fps (mileage may vary by barrel length, etc.) and deliver a whopping 3,237 foot pounds of energy from right out of the gate/barrel. Although I would be doing battle with my toothy nemesis at 30 yards and in, I zeroed the rifle at 100 yards. From the 100-yard line, the rifle put a big dopey grin on your author’s mug. It only took a mere three sighter rounds to walk my way into a portion of the target I call the “close enough for Alaska work” area. This happy occasion was followed by the delivery of a 1¼-inch group at 100 yards. The weapon’s trigger was smooth and the break over reminiscent of some of the higher-end AR-based platforms I’ve shot or utilized for my work over the years. I then fired the weapon at 25 yards and 50 Yards. The hold-over for these distances was negligible…approximately 1.5 inches at 50 yards and three inches at 25 yards. *AUTHOR’S NOTE ON ‘HOLD-OVER’: Since your author is a simpleton in all things math or with words and phrases like ‘coefficient’ or ‘minute of angle,’ the way I visualized ‘hold-over’ for this hunt was as follows: In the event I found myself in the unhappy position of being 25 yards away from an extremely agitated bear staring at me like I was made of ham and Reese’s Cups, my chances of becoming a not-so-happy meal could be abated if I placed my reticle at the top of his ample-sized melon, thusly putting the bullet impact squarely in my adversary’s schnoz/nose area. The felt recoil for the .338 Federal MSR-10 was remarkably light and akin to its more diminutive .308 Caliber semi-automatic AR-10 cousins. Of more importance to your author was an instant familiarity with the rifle’s trigger, operation, and ergonomics. I’ve utilized an M-16 /AR-variant platform for 33 years during a combined career as a member of the U.S. Armed Forces and as a state and federal law enforcement officer. From the Colt M-16 A-1 to the Colt Submachine Gun and M-4, I’ve “had one with” throughout almost my entire public-service career. 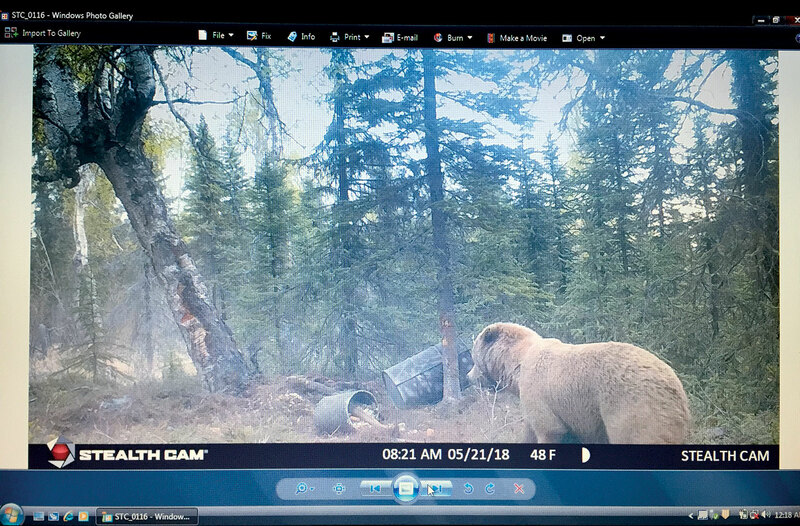 Game-cam shots of the bear Rambo harvested moments before its demise. And I’m here to tell you, familiarity does not breed contempt when it comes to being able to operate a weapon system under less-than-ideal conditions. Like engaging in a confined-space gunfight with multiple assailants, or when being charged down by a furry, toothy, claw-equipped, possibly hungry, and definitely up-armored, 800-pound land shark. When the bear hunting range session was over, I felt upbeat about the MSR-10. The rifle was accurate, reliable, powerful, and capable. And this was a good thing, because in a few days, it would be time to gear up and head to Alaska’s rugged Kenai Peninsula and put the MSR-10 Hunter in harm’s way. Jay, my trusted hunting brother who resides on the Kenai Peninsula, had plans for me and the Savage MSR-10. 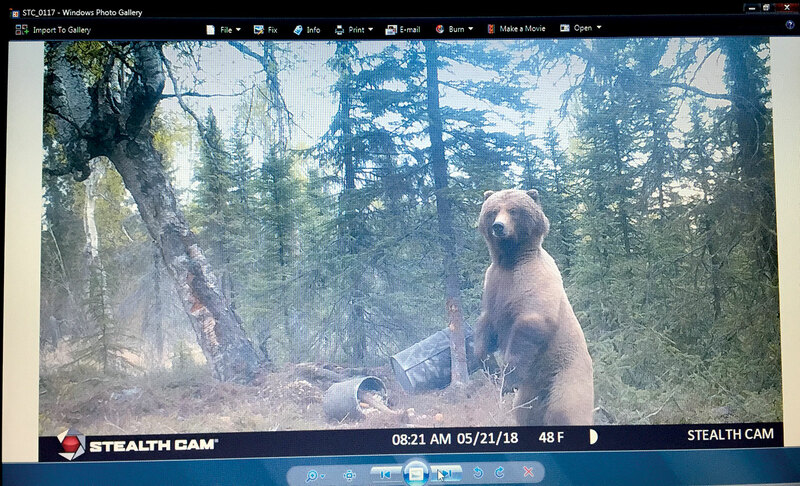 Earlier this spring, he registered and set up a bait station in anticipation of a spring brown bear hunt. Due to work considerations, I had a two-day window of opportunity to harvest a bear. But this is what Alaskans do on their weekends, so I snagged my gear, trailered up an ATV, and moseyed on down to the Kenai Peninsula from Anchorage (not a chore, as the scenery on this route makes one feel like he is in his own Nat-Geo documentary). Upon arrival in the Soldotna/Kenai area, I met with Jay and consolidated our gear onto the ATVs. We then bounced, traversed, and winched across two hours worth of mudholes, unimproved trails, and bogs to the bait-station. We arrived in the late afternoon and found it to be completely devoid of any ‘Scooby,’ or more precisely, ‘Yogi-Snacks.’ Sadly, the once goody-laden site had been thoroughly and ravenously pilfered by our quarry. But we were prepared for this eventuality, and within an hour, our ursine kitchen was up, running, and ready for business. Thanks to Jay’s foresight, when prepping-up, we loaded our ATVs with the equivalent of a commercial trash dumpster-full of expired foodstuffs graciously donated by local stores and restaurants. And let me tell you something. While Jay and I have never attended culinary school, we transformed a decapitated beer keg and a fifty-gallon drum into a sugary cornucopia of stale doughnuts and other pastries. For the second course, we added a savory heap of bear-booty comprised of three 50-lb. bags of dog food. While the doughnuts were of the day-old variety, the dog food could accurately be classified as slightly more than day old (in fact, what year did the Battle of San Juan Hill take place?). We then confirmed the steel drum and beer keg were secured to a stout tree with a length of King-Kong-gauge logging chain and we were ready for business. Jay and I hunted until the light began to fade, then tip-toed out of the area and holed up in a remote cabin several miles from the bait station to get some shut-eye. And we enjoyed all four hours of it, because during springtime in Alaska, darkness falls at 11:30 p.m. and then it’s all sunshine/wakey-wakey-eggs and bakey again at 3:30 a.m.
We arrived back at the bait station just after dawn. 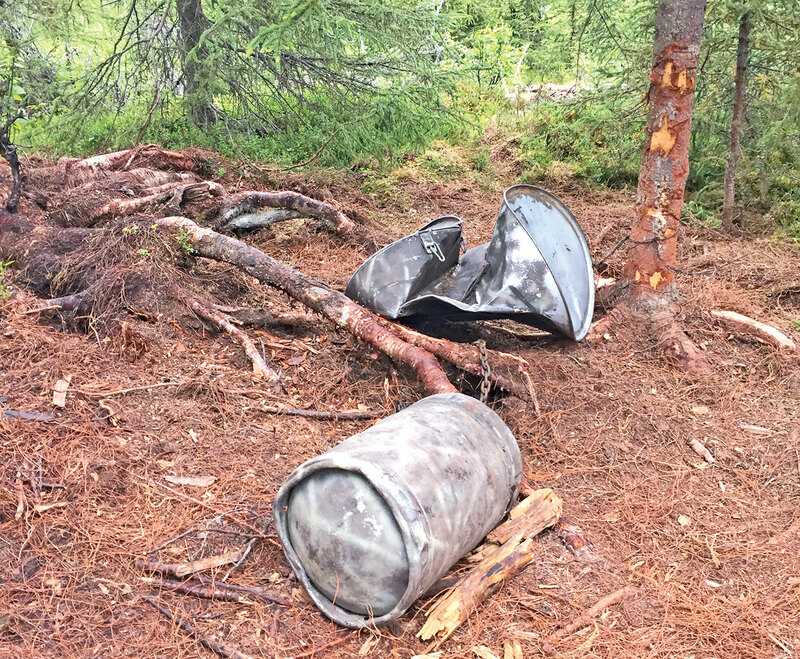 We stashed our ATVs a good distance from the day-old-doughnuts-and-dog-food bistro and cautiously made our way into our “hide.” This “hide” was simply a respectable depression formed behind a large spruce tree that had fallen away from the bait station. We were afforded protection from the rear by its sizeable root-ball and a perfect view to the bait station directly in front of us. As Jay and I sat on our deluxe five-gallon paint buckets approximately 25 yards from the bait station, it occurred to me that while Yogi Bear may have been smarter than the average bear, he was rather ham-handed (or salami, or smoked turkey, or pastrami, or other delicious lunchmeat-handedness of your choosing) when it came to lifting picnic baskets (pronounced ‘pick-a-nick’ by outdoor enthusiasts who want to sound ‘street’) from unsuspecting campers. But from a tactical standpoint, Yogi had an even greater flaw: the inability to be stealthy. A shortcoming that was not shared by the 500-lb. adult brown bear now sliding by Jay and me as smoothly and silently as a wraith 15 yards to our right. This bear’s silence was an anomaly, because in many instances, when characterizing a large brown or grizzly bear’s movement into an area where there is a potential food source or threat, “sliding” is an extremely uncharacteristic descriptor. In my experience, when a bear of the ‘brown’ variety (no offense to any cinnamon-phase black bears out there) moves into an area with a potential food source or adversary, they quite often do so with serious panache…they snort, they huff, they grunt, and sometimes they even break things. Quite simply, black bears are the ninjas of the ursine world, almost always following their own proprietary Bushido Code of stealth and silent professionalism, whereas brown and grizzly bears, well, let’s just say it like it is: They wouldn’t make the Dean’s List at Emily Post’s School of Etiquette and Daintiness. The Savage MSR-10 Hunter proved to be a great choice for hunting one of the most dangerous animals in the world. I held the MSR-10 at low ready, nudged Jay (he was monitoring another path of ingress into our clearing and did not initially observe the approach of our sneaky new neighbor), and we both became an attentive audience as the bear stopped just shy of the bait station and began to turn in circles. As the bear completed several 360-degree turns, it sniffed the air excitedly and scanned its surrounds for potential usurpers to its new-found day-old-doughnut oasis. Although the bear exhibited physical traits and aggressive tendencies indicative of a boar (appearance, posture, and the manner in which it stormed into the area without pause or a care in the world before taking up station directly on a major cache of sweets and other ursine delights), we stayed our hand. Jay and I thoroughly scanned the area around us and maintained a vigil on the bruin to ensure it wasn’t a sow with cubs. When we were satisfied our bear was solo, Jay looked at me and indicated he was ready for go-time. He held his compound bow at the ready (Jay was originally going to back me up with a butterfly knife and a rolled-up copy of Cosmo magazine until I told him I’d make him the cover art for this article), and I went into a combat crouch. I ensured I had a sufficient amount of holdover to clear a log and brambles separating the short 20-yard distance to the bear, and settled the reticle of my ACOG on the bear’s chest. The shot was not ideal, as the bear was facing directly towards us. After I settled in for a potential shot, the bruin may have scented us a bit, as it began to display a smidgen of agitated behavior. The bait station as Jay found it. Note the completely smashed 50 gallon steel drum! This restlessness proved to be its undoing. The bear iconically stood to its full height on on its hind legs, snorted, then dropped to all fours and abruptly turned to stare slightly to our left. This afforded me a respectable quartering shot. I pushed the trigger on the Savage and sent a round, at a slight angle, directly between the bruin’s front quarters and through its right lung. The bear immediately spun in several complete circles and did what angry apex predators commonly do when injured: it perused the area for something or somebody to fang and claw into a gooey pile of pulled-pork/shredded beef. But before we get to what happens to Jay, your author, the bear, or some combination thereof, it’s probably a good time to discuss the importance of follow-up shots on dangerous game. Please ‘bear’ with me (cue the Three Stooges “Wa-Waa-Waaaah” sound effect for that one) while I try to explain. I’ve always had a penchant for flying in, rappelling from, or hanging (usually right-side up) under rotary-wing aircraft. I am equally passionate about spending quality time with some of my best, lifelong friends, who, coincidentally, are healthcare professionals. But, if I must carry my own spleen and/or liver several miles to the closest suitable life-flight helicopter landing zone to make either one of the aforementioned happen, I believe I’ll choose the opt-out selection on THAT blood and/or other body-fluid-coated drop-down menu. 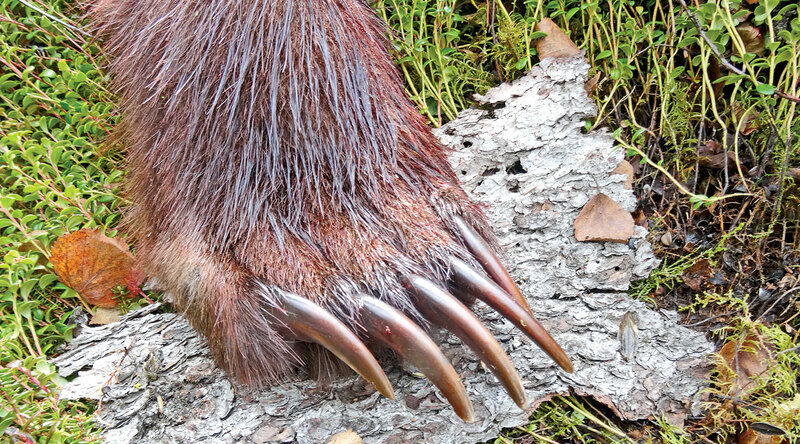 These claws are the reason why you don’t run over to your “kill” for a victory dance until you are absolutely sure that the bear is not of this world. 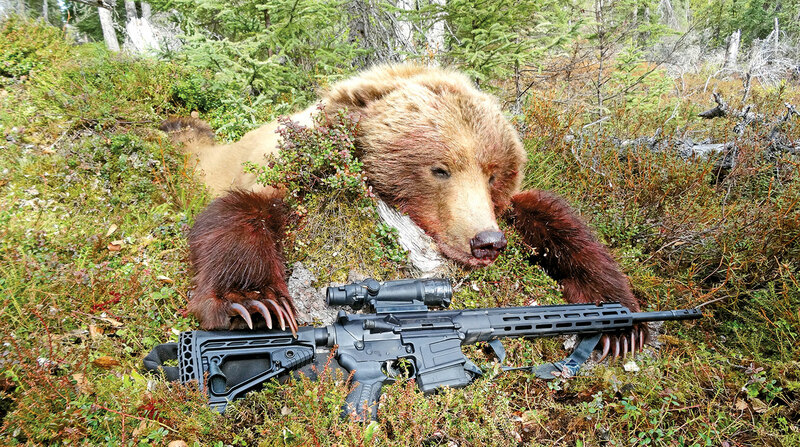 I placed the ACOG reticle center-mass on the enraged, gyrating bear and prepared to make an immediate follow-up shot. I didn’t have to wait long. After the brown bear’s second or third spin, it stopped for just a moment and showcased a perfect broadside profile. I took that shot, the 200-grain copper-solid round connected with a solid “THWOP” (I could swear I heard Jay say something that sounded like “ouch”), and the bear immediately started to evac the area in long, shambling strides. I sent a third shot down-range and again connected with a “THWOP!” This time I didn’t hear Jay say anything, but I did look for a cartoon graphic sound-effect bubble above the bear reminiscent of the ones in the 1960s Batman television series. This shot also hit in the chest/lung area of the bear. 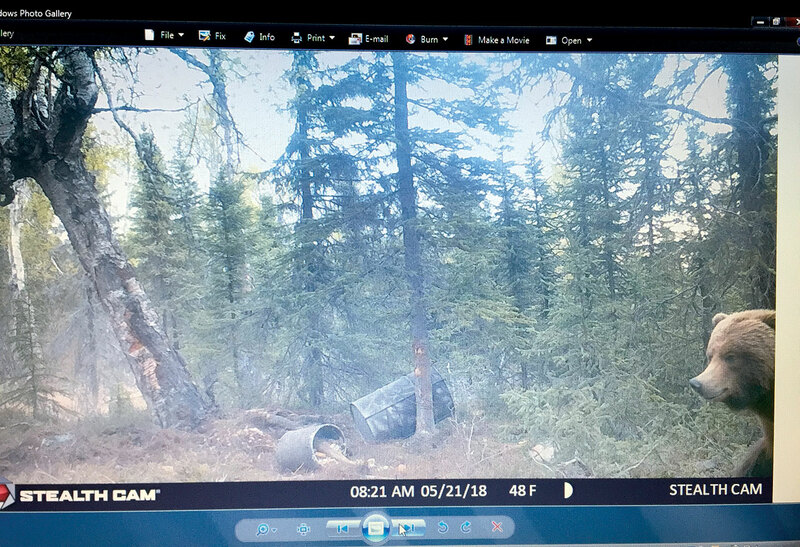 The brown bear stammered away and disappeared into a stand of ground cover and over a slight grade approximately 20 yards from where it was struck. As with any bear Jay and I have been granted the privilege of harvesting during our time in Alaska, we waited for approximately one hour before tracking it. We err on the side of caution, because bears of all species can be formidable opponents. These remarkable predators can soak up massive amounts of damage and incur devastating wounds while still retaining the ability to give an over-anxious/under-patient hunter an unfortunate lesson in why trauma surgeons require a decade of training to ply their trade. After the hour ticked by, we checked our equipment, then slowly and quietly began following the bear’s track. In our experience, many wounded bears don’t leave a significant blood trail at first (or sometimes ever), due to their voluminous body fat. In some instances, even in spring bears, this fat is so thick it resembles blubber. This thick, rubbery tissue virtually emulates a run-flat tire when it comes to stopping leakage from a wound. But this bear’s lungs were on the receiving end of potentially three 200-grain .338 Federal rounds. Rambo and the defeated beast. Our initial observation of arterial blood coating the ground willow around our newly created crime scene was an encouraging indication that the harvest of this brown bear would likely prove to be swift and humane. We didn’t have to track the bear far. Our bruin expired almost the minute we lost sight of it on the backside of the slight terrain divot. 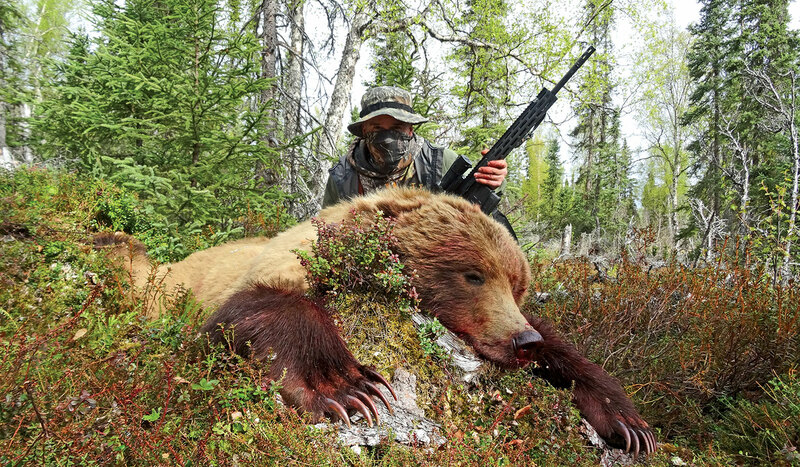 If the bear was, in fact, dead, the total time of the engagement, from the first shot until the bear succumbed to the three MSR-10 Hunter rounds was approximately 10 seconds. But first we had to ensure that the brownie was, indeed, dead, because many bear hunters who have gone before us learned the hard way that sometimes, just like an ex-sweetheart, your nemesis is faking it. protein bar, but only if you have adequate backup). If you follow the Jay/Rikk “Potentially Wounded but Hopefully Dead Dangerous Game Approach Protocol,” we personally guarantee you will have an 80 percent chance of walking away from your bear hunt with the same number of limbs and appendages you set out with. Jay and I followed the protocol and confirmed our adversary was as dead as Julius Caesar. Our brown bear was a barren sow, and later measurements confirmed the bear squared out at seven feet, three inches in length. The MSR-10 Hunter proved to be a highly accurate, capable weapon for this hunt. 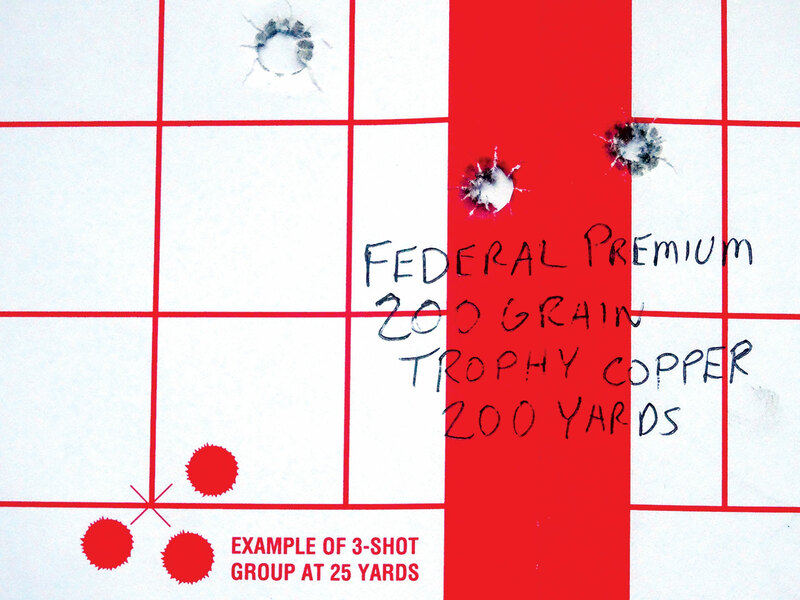 The .338 Federal cartridge performance was also to be lauded. The first round (quartering) devastated the bear’s right lung longitudinally, and the two follow-up shots (broadside) double-lunged the bear and definitively sealed the deal. This wasn’t our first rodeo, and with Jay’s expertise and my stunning good looks, we had the bear skinned and dressed in 58 minutes (I know this because Jay has this Ralphy’s dad from the movie A Christmas Story thing about timing the skinning-out process). We repeated our muddy/soggy ATV trip back to our rig and completed the necessary paperwork for the fine folks at the Alaska Department of Fish and Game and I was wheels-up and headed home. Home. The place where those who love you are waiting to give you a hug, squeeze, or generous portion of tail-wagging to let you know how much they missed you. The place you return to from danger when your tactics are sound, friends reliable, and weapon capable. Final Test: Could I Get That To Go (To The 300-Yard Line) With An Order Of Extra-Dirty, Please? Before the MSR-10 Hunter began the long trek back to the lower 48, it was put through one more round of range work. This time, I attached a 1-6.5x24mm Elite Tactical optic sent to me by the kind folks at Bushnell and ranged the rifle out to the 300-yard line. Now, I have no idea what the 5R rifling hype is all about (mainly because it has to do with math and physics and stuff), but it obviously came into play at the 100- to 300-yard lines, because the rifle performed exceedingly well, given sporadic wind gusts and your author’s caffeine level. 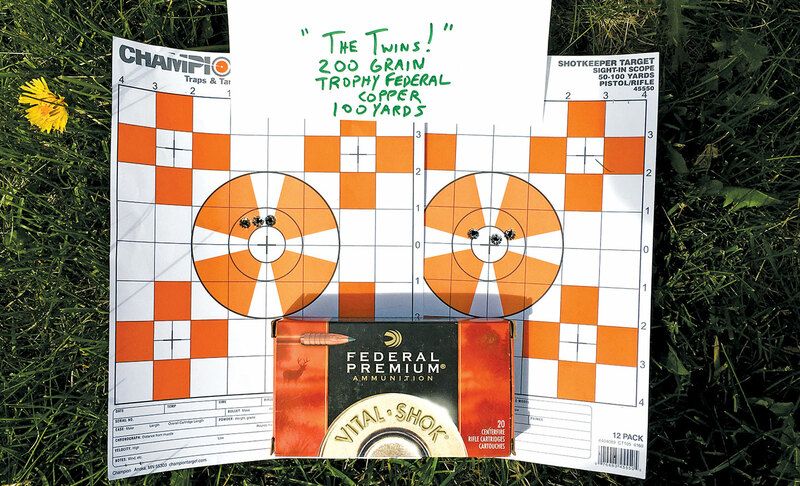 At 100 yards, the rifle printed back-to-back ¾- and 1-inch groups (affectionately referred to as “The Twins”) using the Federal Premium Grade Copper rounds. At 200 yards, it opened up and scored a 2-inch shot string, and at 300 yards, printed a respectable 3¼-inch trio. These groups were fired using the Federal Premium 200-grain Copper rounds used earlier on the bear hunt. Several other rounds were fired during this phase, of which the 185-grain Fusion MSR also performed admirably. 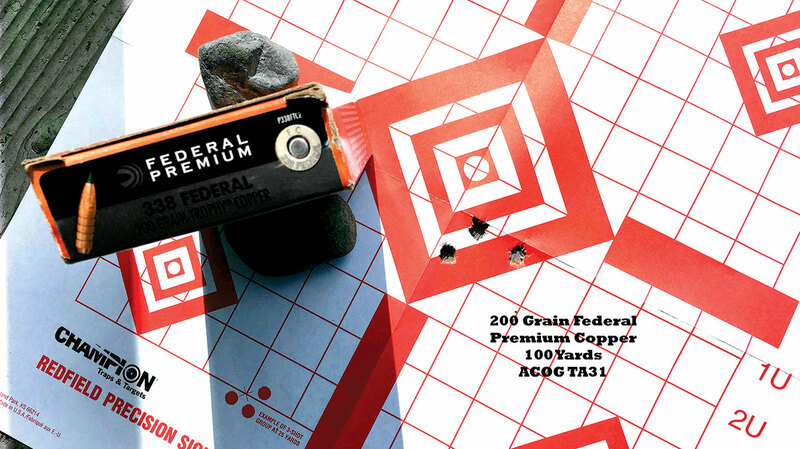 The Fusion MSR three-hole punched the target with a 1¼-inch group at 100 yards. After the serious range work was done, I shot an additional 100 rounds at steel from the 300-yard line like a man possessed (and also late for dinner), and I did it dirty. No cleaning, no lube, not even a kind word, and the rifle ran, and ran, until my ammo supply was depleted and the 300-yard gong was in serious need of a face lift. And with that, it was time for goodbye. As I boxed up the rifle, I mentally reviewed the good, the bad, and the ugly. The good column was infinitely longer than the latter two. During my time with the MSR-10 Hunter, your author experienced only one bump in the road. That bump occurred during the first 30 rounds to go down range from the newly unboxed rifle. The Savage MSR-10 Hunter and Federal .338 FED ammunition are the combo you should consider when hunting large and dangerous game with a modern sporting rifle. The Mag-Pul 10-round magazine included with the rifle performed flawlessly, but I had three consecutive failures to feed with a newly purchased Mag-Pul P-Mag 20-round magazine. I found this to be an anomaly, however. After experiencing the failures to feed, I left the magazine fully loaded for several weeks and continued to break the rifle in with the Mag-Pul 10-round magazine. During the final range session, I fired nearly 120 rounds (with a purposefully, even sinfully, uncleaned rifle) without a single act of intransigence by the now-broken-in 20-round magazine or buffer spring. My take on this hiccup was that the fresh, out-of-the-box rifle needed to go through a shooting evolution or two in order to season the super-beefy buffer spring on the rifle, as did the tight new Mag-Pul 20-round magazine. And that is the story of the Savage MSR-10 Hunter’s Alaskan adventure. A fully capable North American big-game rifle combining reliability, accuracy, and to those who have served, a familiarity in the field (or back-country) that almost makes you feel like…well…like you are cheating.